The center core of SpaceX’s three-booster Falcon Heavy rocket that launched from Kennedy Space Center last week will not make it back to the Space Coast intact, the company confirmed Monday. “While we had hoped to bring the booster back intact, the safety of our team always takes precedence. We do not expect future missions to be impacted,” he said. While SpaceX does have hardware on its drone ship designed to secure first stages – often referred to as a flat “robot” that holds them in place – it was not used for this mission, which successfully took an Arabsat satellite to orbit last Thursday. The connections between the robot and center core aren't compatible like they would be with a standard Falcon 9 booster, but SpaceX is expected to upgrade both in the future. The mission from pad 39A marked the first time all boosters from a Falcon Heavy rocket were recovered successfully. The vehicle's first launch early last year saw the two side boosters land at Cape Canaveral, but the center core ditched into the Atlantic Ocean. Thursday's mission, meanwhile, did see a successful landing on the Of Course I Still Love You drone ship. 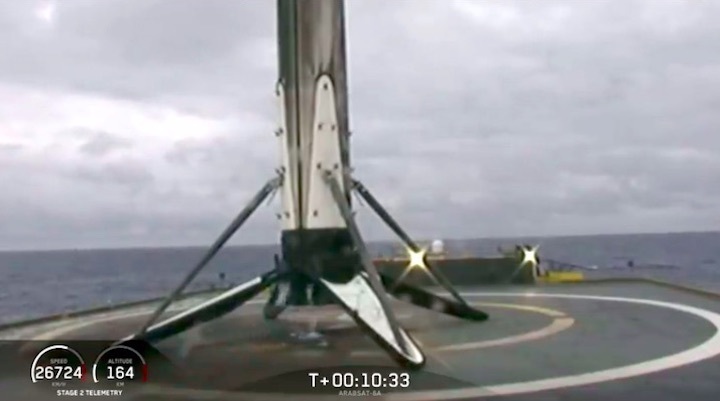 After liftoff, CEO Elon Musk confirmed that the rocket's fairing halves – or nose cone that protects the spacecraft – were recovered and will be used for an internal mission known as "Starlink" later this year. The next Falcon Heavy launch with military payloads is expected no earlier than June, the Air Force confirmed via Twitter on Monday. It will host dozens of experimental missions.